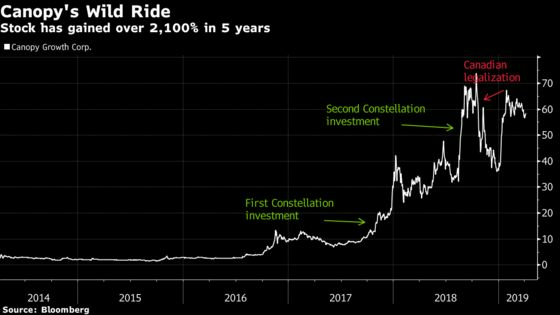 (Bloomberg) -- Five years ago today, the first pot stock began trading on the public markets, prompting a few raised eyebrows and many, many bad puns. Today, that company is worth nearly $15 billion. Canopy Growth Corp., then known as Tweed Inc., listed on Toronto’s TSX Venture Exchange on April 4, 2014 via a reverse takeover of a capital pool company. Shares closed that first day at C$2.59 and have gained over 2,139 percent since then to C$58 Thursday morning. If you were lucky enough to sell at its high of C$76.91 in October, your return would have been 2,869 percent. 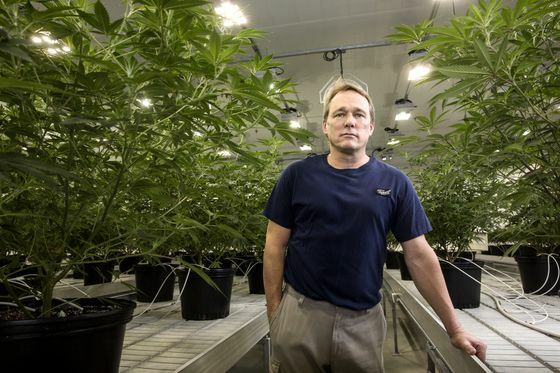 But Canopy, under chief executive officer Bruce Linton, bet that investors would want a piece of the cannabis industry. Since then, it’s been a consistent trailblazer on the public markets. It was the first marijuana company to uplist to the Toronto Stock Exchange, the first to be added to Canada’s benchmark S&P/TSX Composite Index, the first to hit $1 billion in market value and the first to list its shares on the New York Stock Exchange. It was also the first pot company to secure a major investment from a partner outside the industry when it announced an initial C$245 million investment from Constellation Brands Inc. in October 2017 followed by an additional C$5 billion in August 2018. Linton himself has been a beneficiary of the gains. His stake of 2.5 million shares is worth C$145 million on paper, according to Bloomberg data. 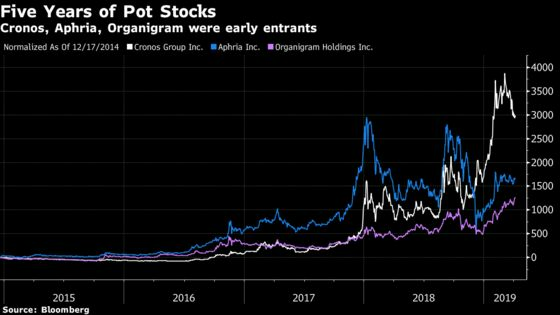 Cronos Group Inc., which recently closed a C$2.4 billion investment from tobacco firm Altria Group Inc., has gained nearly 3,000 percent from its first trading day on Dec. 17, 2014 when it was known as PharmaCan Capital Corp. Aphria Inc. is up nearly 1,500 percent since its debut on Dec. 8, 2014 and Organigram Holdings Inc. has gained about 400 percent from its closing price of C$1.97 on its first trading day of Aug. 25, 2014.